วันพฤหัสบดีที่ 10 มีนาคม 2016 เวลา 05:20 น.
Nicholas James "Nick" Vujicic (born 4 December 1982) is an Australian Christian evangelist and motivational speaker born with Phocomelia, a rare disorder characterised by the absence of legs and arms. As a child, he struggled mentally and emotionally as well as physically, but eventually came to terms with his disability. He presents motivational speeches worldwide which focus on living with disabilities and finding hope and meaning in life. During secondary school, Vujicic was elected captain of Runcorn State High School in Queensland and worked with the student council on fundraising events for local charities and disability campaigns. After his mother showed him a newspaper article about a man dealing with a severe disability when he was seventeen, he started to give talks at his prayer group and later founded his non-profit organisation, Life Without Limbs. Vujicic promotes his work through television shows and through his writing. His first book, Life Without Limits: Inspiration for a Ridiculously Good Life, was published by Random House in 2010. He markets a motivational DVD, Life's Greater Purpose, a short documentary filmed in 2005. The second part of the DVD was filmed at his local church in Brisbane – one of his first professional motivational speeches. He markets a DVD for young people titled No Arms, No Legs, No Worries!. 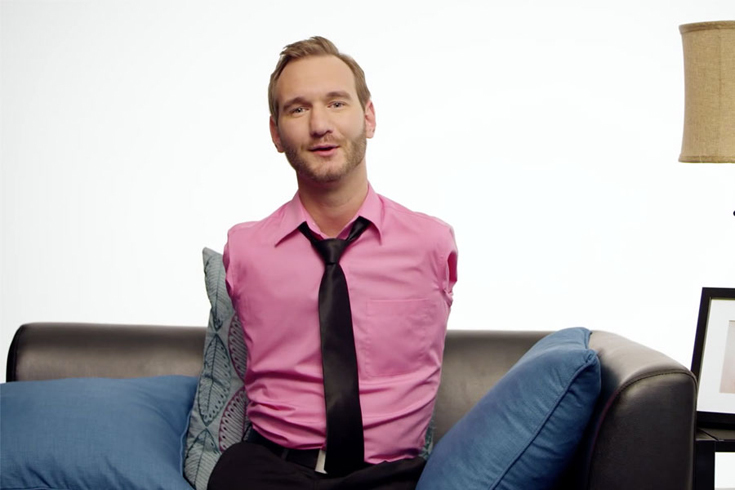 In March 2008, Vujicic was interviewed by Bob Cummings for the 20/20 American television show. Vujicic starred in the short film The Butterfly Circus, which won the Doorpost Film Project's top prize of 2009. In 2010, the film also won two awards as the Best Short Film at the 2010 Method Fest Independent Film Festival. At the same film festival, he was awarded Best Actor in Short Film for his starring performance as Will. Butterfly Circus also won the best short film award at The Feel Good Film Festival in Hollywood in 2010. Vujicic is a motivational speaker with TED. He gives life advice to his readers. For instance, he advocates that the way to find hope even in the most harsh of situations is to have a light-hearted discussion and stop grieving, and you will become tough and stay firm in any situation so that you can keep living your life the way you want. He advises readers to hold onto hope so that it cannot disappear, be able to accept danger, and learn to laugh, be thankful to God, and be willing to serve others before yourself, is the key. His main goal is to share God’s love for his readers, who he wishes to experience the brightness and satisfaction that God planned for them. He often says that people ask him, “why are you so happy?” His reply is that he is happy since he is one of God’s creatures and has not put limits on his life and goals. He asked his parents when he was at the age 13 about his birth. Several days before he was born, there was no notification from neither Doctor or nurse that something was wrong with the baby. However, on December 4, 1982, when he was born, when his mom asked the nurse how was the baby, there was a silence among the nurses. And when his mom persisted to ask the doctor what happened to the baby, he said “phocomelia,” and since his mother worked as a paediatrician nurse in charge of a delivery room, she immediately knew what the medical term meant. At first, she refused to see him or hold him when the nurse had him in front of her, but she and her husband tried to accept it and tried to understand God’s plan for their son through a strong faith in God. There was a lot of worry from his parents when he was a child, but he improved and showed that he can be like a normal child. Even though his mother gave him a cushion to support himself, he overcame and taught himself how to stand up with a method by leaning his forehead over the wall and slowly standing up. Originally, he was born with combined two toes, so he could have just used them for rolling himself over, shoving, and bracing himself. Thus, his parents and Doctor decided to have an operation to separate those toes so that he could use them as fingers to grab, turn a page, or many useful functions. Even though the operation didn’t go as well as the doctor wanted, he tried to adapt using these freed toes and got an electronic wheelchair, a computer, and a cell phone to free him even more so. He concludes that his childhood was an ‘amazingly normal childhood’, and he advises the readers to not give up, to change your circumstances if needed, and to stop their concern, around if their luck will be better, and run after any desire. I read this post completely about the difference of most up-to-date and earlier technologies, it's awesome article. This post is actually a nice one it helps new net users, who are wishing in favor of blogging. no one else understand such certain approximately my difficulty.